The Swallows India-Bangladesh was formed in 1959 and started development work in India in the 1960s. After the Bangladeshi War of Independence the Swallows started supporting victims of the war through various relief activities. It soon became obvious that Bangladesh was in dire need of more long-term development programmes. Today Bangladesh is one of the countries with most NGOs and a large development sector. During the 1980s it was possible to start working directly together with Bangladeshi NGOs and this tradition has been followed up until today when the lingo of development work is words such as "partnership", "local ownership" and "development cooperation". Ideals that sometime are difficult to live up to in real life, but steps in the right direction. Today the Swallows in Bangladesh fund about 7 local partners, working in different parts of the country. The projects can de divided broadly into agricultural projects and social mobilization projects. The aim of most of the projects is to improve the situation for disadvantaged groups, with a special focus on rural women. The main function of the Swallows today is to act as a partner and facilitator for discussions, strategies, visions and necessary activities to reach long-term goals of a sustainable and just development. 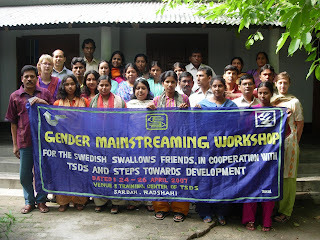 This work is carried out e.g through the Swedish Swallows Friends Network where courses and seminars are arranged on behalf of our partners on issues where they identify a need for more knowledge. Last week a three-day seminar was held on gender mainstreaming.